Because sometimes science involves the world’s most beautiful natural harbour. What’s tested with Sydney Harbour water, made from an ingredient in most kitchen pantries and invented down the corridor from where we created WiFi? Our latest breakthrough with graphene, that’s what! Perhaps best known for its starring role on Tony Stark’s face, graphene is a wonder material of the future. It’s just a single carbon atom thin but still manages to be the world’s strongest material. It’s also water repellent, which makes it all the more surprising we’ve just managed to use it as a water filter. In a just published paper, our researchers Dr Dong Han Seo, Dr Adrian Murdock and Dr Zhao Jun Hantook took some of our own patented form of graphene, called Graphair, and turned it into an extraordinarily effective filter that supercharges water purification; making it simpler and faster. 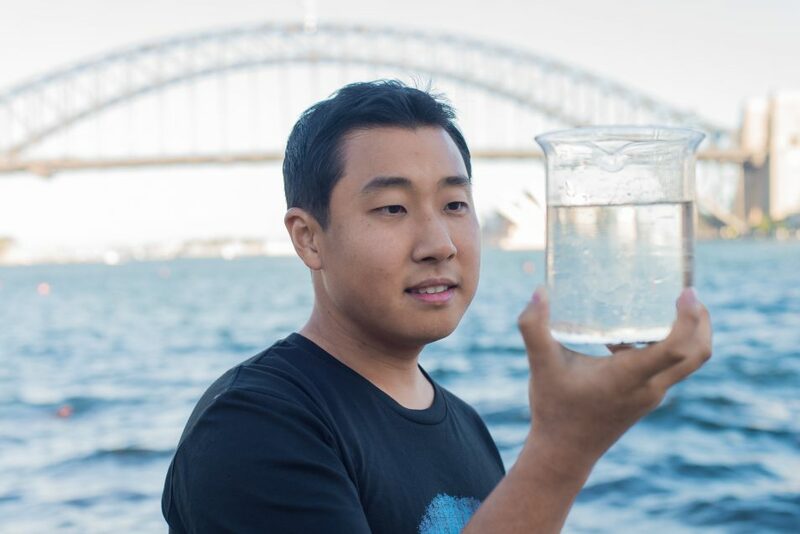 It all began when our graphene team travelled down to Sydney Harbour, scooped up some water, and took it back to their Lindfield laboratories, near where our pioneering work in radioastronomy was transformed into WiFi. Previously, contaminants had been a problem for water filtration. Chemical or oil based substances would coat water filters with pollutants, stopping them from doing their job. It meant water filtration needed to be a time consuming and expensive two stage process: remove the contaminants, then filter the water. What would happen though if we placed Graphair film over a normal, commercial grade water filtering membrane? Researchers from the University of Sydney, UTS, QUT and Victoria University tested and analysed Graphair and its water purification qualities. They found that without Graphair, the membrane’s filtration rate halved in 72 hours, as contaminants clogged it. When the Graphair was added, the membrane didn’t clog, plus it filtered more contaminants and water. Graphair is specially designed with microscopic nano-channels. These nano-channels let water pass through but stop pollutants because of their larger molecules. One of the great things about Graphair is that it’s simpler, cheaper, faster and more environmentally friendly to make than other graphene. In fact it’s made out of soybean oil, most often found in vegetable oil. So now we can make a better, cheaper, and more effective water filter using a common cooking ingredient. This could mean proper, effective water filtration is in reach of developing world communities. Currently, around 2.1 billion people, a third of the world’s population, don’t have clean and safe drinking water. As a result, millions die from diseases associated with inadequate water supply, sanitation and hygiene every year. Graphair films could help create clean drinking water in a single step, regardless of how dirty the water once was. All that’s needed is heat, our graphene, a membrane filter and a small water pump. We’re hoping to scale up the technology so it can be used to filter a home or a town’s water supply, as well as other uses such as the treatment of industrial waste water. The article above does not explain to a student of science how the grapheme or grphair prevent clogging of the filter. I still admire the invention though I cannot understand the process. ARE THERE OTHER POTENTIAL USES FOR GRAPHAIR. LIKE USE IN HEARING AIDS TO FILTER UNNECESSARY SOUNDS . Great article about water filtration only spoilt by the repeated reference to wifi. I love wifi but I’m pretty sure the CSIRO is bigger than that one invention.